Today, the IPCC's Working Group III has published the 'summary for policy makers' chapter of their special report on renewable energy sources and climate change mitigation. 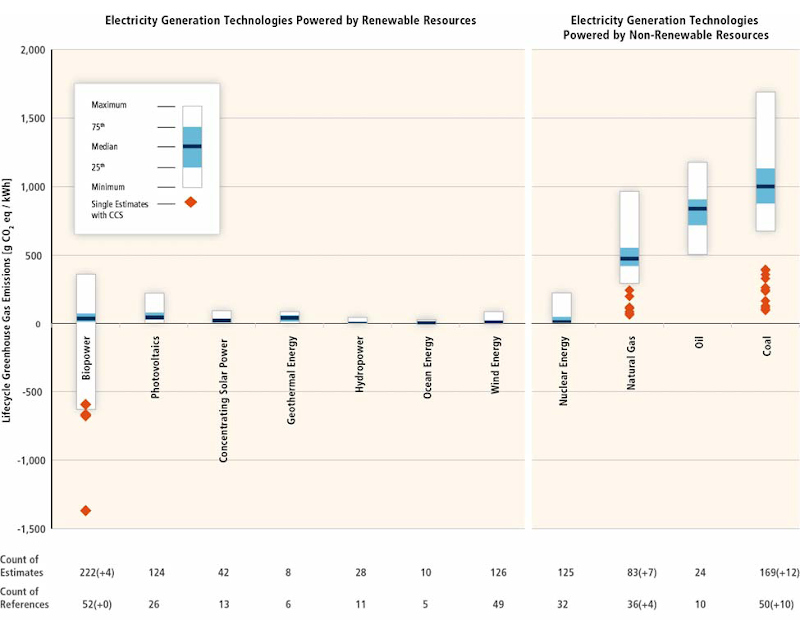 In the summary, I found a figure on the lifecycle greenhouse gas emissions estimates for electricity generation technologies. Compared to renewable resources, fossil fuels' greenhouse emissions are gigantic. Emissions of three energy sources seem controversial. Biopower's emissions span from negative to positive. Photovoltaics and nuclear energy can emit either near-zero or up to almost 250 grams of CO2 equivalent greenhouse gases per kilowatt-hour.